Eloqua, a wholly-owned subsidiary of Oracle, is the leading provider of modern marketing automation and revenue performance management software that helps ensure every component of marketing works harder and more efficiently to drive revenue. Eloqua’s software is now the centerpiece of the Oracle Marketing Cloud. Companies across a wide range of industries rely on Eloqua’s cloud-based software, professional services and education programs to help them automate marketing processes across multiple channels, target and nurture prospects and deliver highly qualified leads at a lower cost to sales teams. For more information, visit www.eloqua.com, subscribe to the It's All About Revenue blog, call 866-327-8764, or email demand@eloqua.com. Download the new BtoB Research Services report to see if your marketing practices measure up to Modern Marketing. BtoB Research Services surveyed hundreds of online marketing professionals to uncover the core competencies of Modern Marketers. Now you can understand the forces that are shaping Modern Marketing and what successful campaigns use to compete in today’s digital jungle. Download Defining the Modern Marketer: From Real to Ideal to read the findings and conclusions. Modern Marketing: Art or Science? This new definition of Modern Marketing examines how the modern marketer performs on a digital competency scorecard. 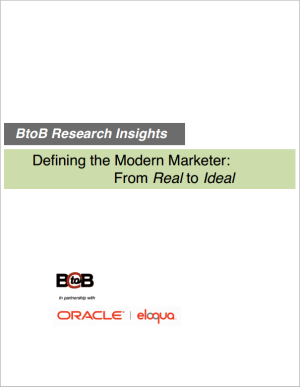 Download Defining the Modern Marketer: From Ideal to Real now—courtesy of Eloqua.